One of the things foreigners living in England always struggle with is identifying the social trip wires. How do you hold your fork? Is it a napkin or a serviette? Do you need to go to the toilet, lavatory or loo? IMHO 🙂 the fact that even the garden isn’t safe has always seemed just a tad ridiculous. I mean, take the ordinary pink (or blue) mophead hydrangea. Is it an acceptable shrub for a middle-class, wannabe-upper-class, garden? 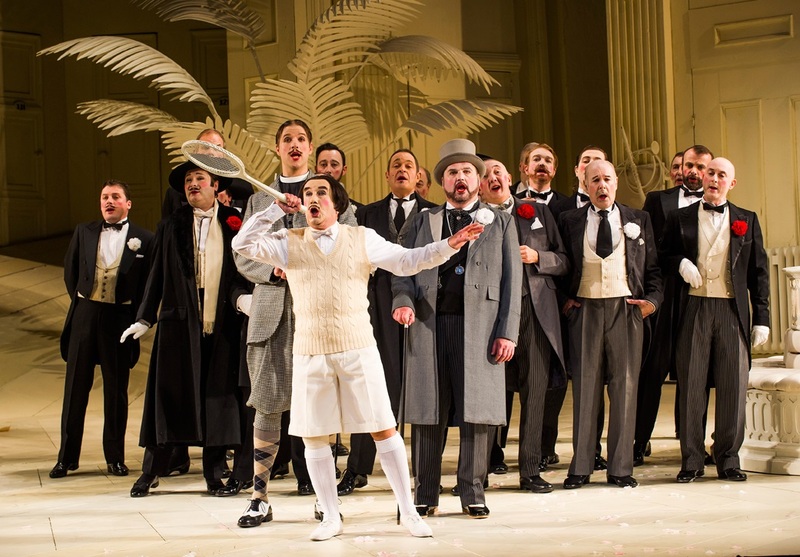 And when it comes to music, Gilbert & Sullivan – did I hear several sharp intakes of breath? – is a very, very pink (or blue) musical version of the hydrangea. Not a lace-cap one (they’re OK, especially if white). Just an ordinary, big-bloomed, blowzy one. The production of the Mikado we saw last week was first performed 29 years ago. And it created a dilemma for the cultured classes then, in its own, small, artistic way. 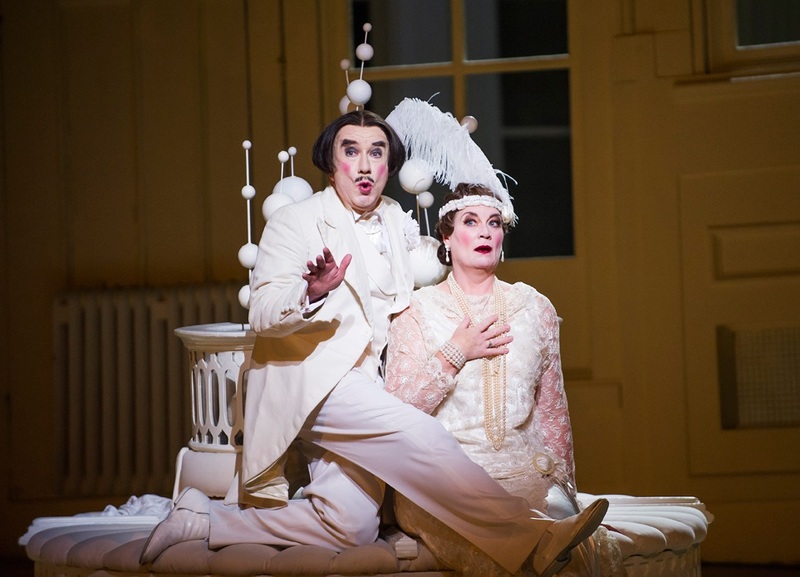 Not only was it staged by the English National Opera (acceptable), it was – and still is – directed by a man who’s undeniably classy, clever and cultured. A human colossus of taste and style (don’t quibble with my construction, I’m tired, it’s December and I have a cold). So what did those who needed to read all the class runes correctly do about this radical Mikado (for radical it was)? I don’t know – and I don’t care. Because I enjoy Gilbert & Sullivan. There – I’ve said it. I can see the curl of sneering lip, the wrinkle of snooty nose. The not-quite-concealed smug smiles. 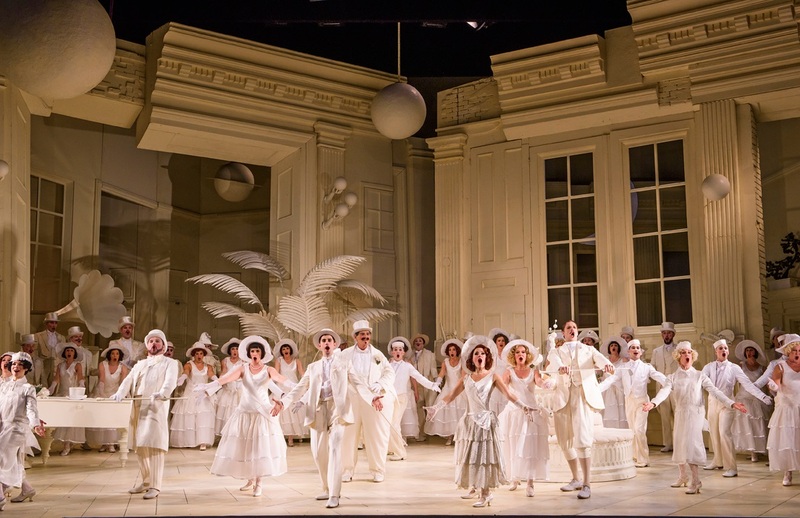 My own enjoyment of G&S – the Mikado in particular – goes back to my teenage years, revising for exams, with a very bad cold, at home. My parents had a two record set. I played them, again and again. Loved the tunes, could understand most of the words. The first G&S production I saw in real life, though, was not the Mikado. It was an amateur production at my father’s school, combining the talents of his boys’ school and my girls’ school in Trial by Jury. All I can remember about it is the boy I fancied. Gerard. Ges. Good looking, great singer. And a heartbreaker (not mine). – sorry, where was I? Got a bit distracted there. Oh yes. Wicket-keeping, rugger-playing chap took me to see Ruddigore, one of the lesser known G&S works, in Oxford. Having worked a couple of years in Basingstoke I’m not convinced of its likely effectiveness. Last week we went to one of those ‘live’ screenings at the cinema. 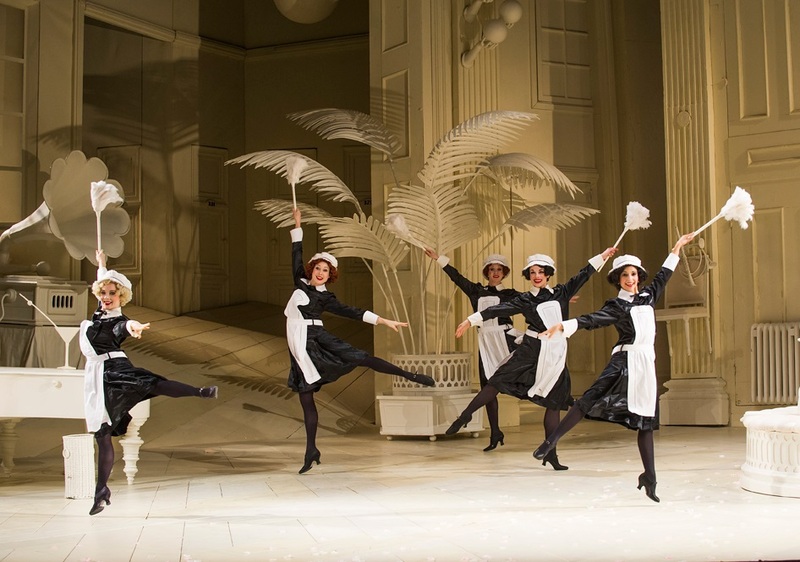 It was a revival of the same Mikado we were fortunate enough to see all those years ago. 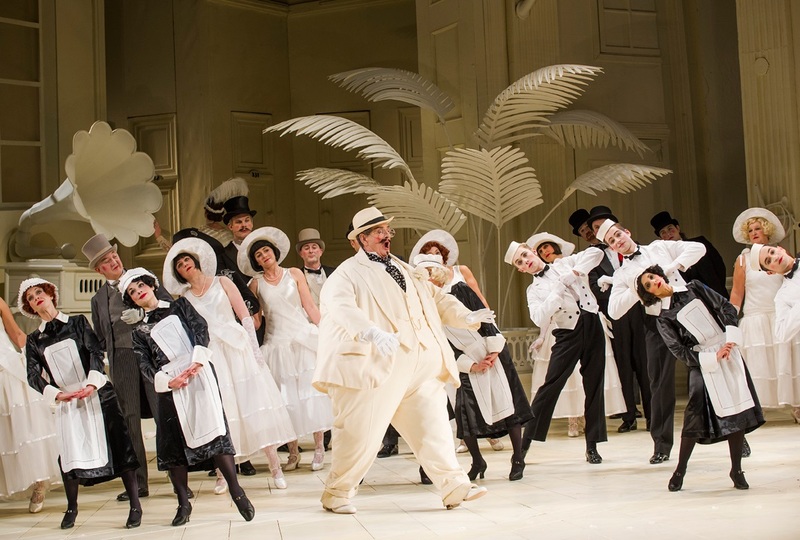 One reason it was and still is deemed so radical is because the set and costumes are all cream and black, the people are smart 1930s society types and it’s set in a genteel seaside resort. Not a hint of oriental, cherry blossom Japan. I could hardly contain myself at times, at the cinema. I was desperate to join in. Not just with the songs – but the dancing. Tap dancing. I challenge anyone to see this production and keep their feet still. It’s utterly, utterly joyous. Lest you think this depressive leopard has changed her spots, there was something. More than one something. I was not feeling too hot, world getting me down, life passing me by – you know, the usual stuff. It dragged me out of myself and threw me around like a Scottish dancer in a reel. I loved it. G&S are – IMO – great social commentators. As relevant now, in many ways, as they were in the nineteenth century. And I couldn’t help but notice the parallels. Titipu – the mythical place where the action is set – has an Emperor – the Mikado. To steady the young men of Titipu he’s set a law that ‘all who flirted, leered or winked (unless connubially linked)’ should be beheaded. One poor chap, Ko-ko, was found guilty of said crime – but escaped by virtue of becoming the Lord High Executioner. The Lord High Executioner has a little list of people ideally suited to execution because they would not be missed. I laughed, with everyone else, at the revised and updated version to which we were treated. And I thought about Isis/Isil/Daesh. And Saudi Arabia. Decapitation is something they seem to have in common. It’s no laughing matter. But laugh we did. And then there was the corruption. Epitomised by the Lord High Everything Else. And by the Mikado being able to say something was so to make it so. The agèd and ugly Katisha. Struggling to marry because of her looks and age. I saw a fun amateur production in which Katisha was in real life a reasonably elderly lady. “You won’t hate me because I’m just a little teeny weeny wee bit bloodthirsty, will you? “Are you old enough to marry, do you think? Won’t you wait till you are eighty in the shade? There was more that rang contemporary bells – I won’t bother you with it though (not even the blade and the vertebrae – no don’t ask). I’m aware that sometimes my perspective is a little warped. And I haven’t enjoyed myself so much in a long time. But there’s still a teeny worry, at these contemporary parallels. I don’t think she’d be missed — I’m sure she’d not he missed! This entry was posted in Art, jaunts & going out, Britain now & then and tagged beheadings, class, Daesh, English National Opera, Gilbert and Sullivan, hydrangeas, Isil, Isis, Mikado, Ruddigore, Trial by Jury. Bookmark the permalink. 9 Responses to Beheaded for flirting? LOL! It’s become a far too complicated subject to discuss here, and I wouldn’t even want to, but I love G&S. I just wish my children knew it as I did when we performed them at school, without any now “politically incorrect” connotations. It was just, no, more than just, good literary fun. You may disagree with me here, but that’s what it was at the time – Ah! you may say, but the contemporary context in which this was acceptable is now discredited as racist, imperialist etc..See what I mean? But did you just remember those phrases ? You’ve looked them up, haven’t you? It is complicated – ironically for such supposedly (supposedly) ‘simple’ works. But they never were simple. Imagine the feelings of the Japanese at being lampooned like this! If you look at the original 1980s version of this production the men pull at their eyes to make them slanty. Shock, horror! But then it’s not really about the Japanese… Like you, I might guess, I loved the stories, songs, music, humour and infectious fun. I actually think they transfer to our contemporary world quite well which is kind of what I was trying to say in a gentle way. I am intolerant of intolerance 😉 and that applies to accepting the way things were as well as accepting people’s right to say fairly disagreeable things. Gosh (I nearly wrote golly!) how liberal I sound. Anyway, I do remember a lot of the words but did indeed look them up to make sure I got them right. We’ve been lucky (not sure the husband really would agree with that mind) to have friends nearby who not only perform in am dram G&S but he even directs it. I have probably seen Yeomen of the Guard enough times for a few years though! I love Pirates and Iolanthe – what about you? My childhood was a cultural desert I think but unsurprising given my family, location and era – no G&S. Musicals were on TV or -groan- school drama performances. But some ‘cultural’ offerings I did experience like Enid Blyton’s Noddy stories, Bill & Ben the Flower Pot Men and the Black & White Minstrels are no longer acceptable as well as a few other local examples involving stereotyping. Like G&S they were of their time, and invoke enjoyable memories for many but we now have other offerings, more respectful to reflect current cultural norms. Those captive audience childhood film and school musicals scarred me, so other than notable examples like Cats and Phantom of the Opera it’s not a genre I generally pursue. I hated the Black and White minstrels – never ever understood the appeal and they stayed on TV way too long. Didn’t like Bill and Ben either. What I was trying (among other things) to say about G&S is that apart from being fun and having good singalong kinda tunes 😉 they are much more satirical than many people realise. Brought up to date (as the ‘I’ve got a little list’ usually is in modern productions) they can often be a critique of what they appear to be endorsing. I’m not a fan of musicals – I only went to see Phantom because I had to take clients for my work but admit I thoroughly enjoyed it! A friend accused me of being snobby about them which may have an element of truth! But actually I think it’s just there are limited amounts of culture I can espouse and so have relegated musicals and dance, not because I don’t enjoy them but for lack of capacity. I’ve never seen Cats and it’s only when I think of Sound of Music and Mary Poppins that I realise I may be a bit blind to the power of the musical to entertain me. I do like some serious opera but we don’t get much chance to attend it round here. And shhh – don’t tell – I’m not a big fan of theatre either!